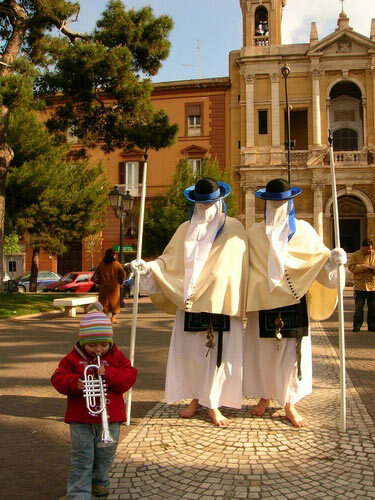 The bare, violent, deafening reverberations of the troccola (a traditional wooden instrument), shaken by its barefoot, hooded carrier amidst an almost oppressive silence, leads the way in the slowest and most moving procession in Puglia. 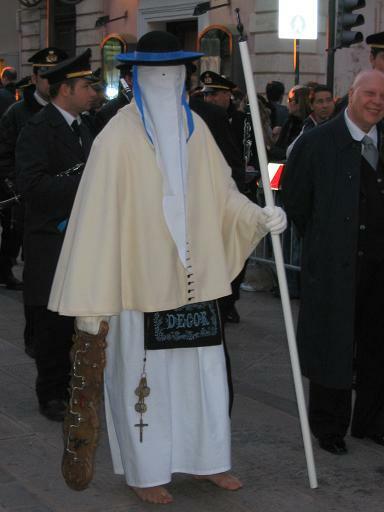 In Taranto, Holy Week is transformed into a unique, indescribable event. It must be lived, participated in; it is pure faith nourished by an entire year of hard work. Families consider it an honour to together carry the statue of the Passion of Christ – for the entire, difficult night, step after step, in a slow, rocking rhythm, like the hand of the great Mother who puts her Child to sleep. 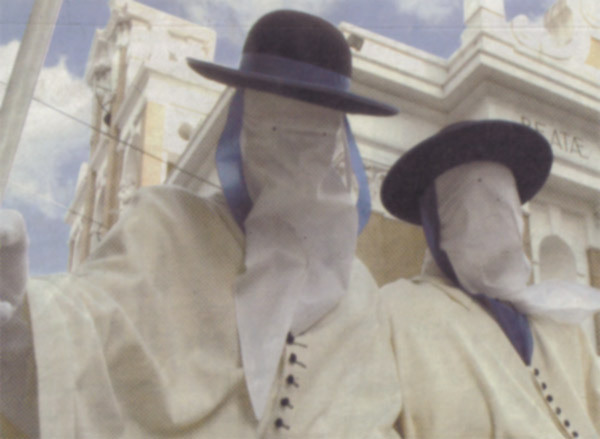 In the evening, everyone sets off: the hooded men with their shuffling steps, the many statues, the Virgin in mourning with her white handkerchief . . . and the night goes on imperceptibly, the sounds of the Troccola plunging their souls into the deep beyond. The darkness of the night is lined with flickering lights, and everything remains stopped as in a time suspended, waiting for an event, the repetition of an occurrence at once tragic and absolute. Then, after a time that seems like an eternity, comes the first light of the new day. Finally everyone re-enters the Cathedral. And they leave an awful, overwhelming emptiness. The doors close, and the Troccola becomes silent; a gloomy heartbeat remains, the pain diffuse among the cobblestones. It’s an unforgettable event that lasts an entire night and moves even the most hardened of souls. It is the living, unique, indelible embodiment of Pain; of a deep pain, eternal and without weeping. The observant participants encircle the hooded figure; the dark wing of Night penetrates every lost heart, recollecting the past, calling to the deep, hidden layers of the unconscious, and reminding everyone of the incredible shortness of life. For believers and non-believers alike, it seems almost a rite apart, elevated and tragic, calling to mind the futile efforts of the drowning man, the misery of man who has lost the Way.